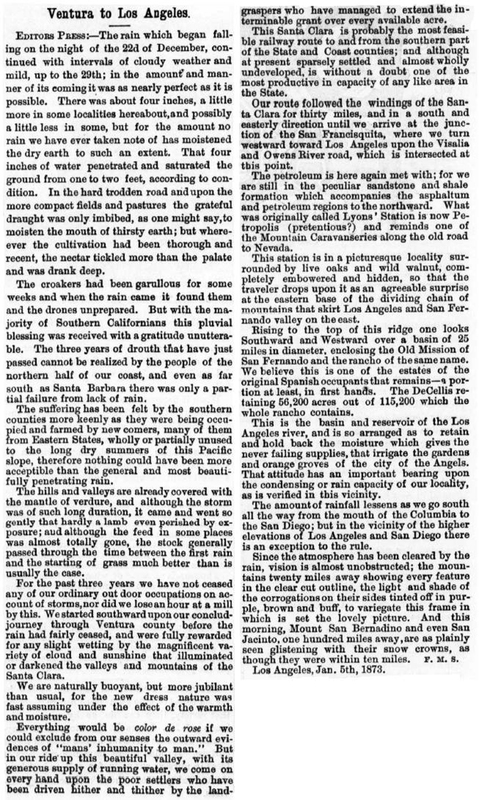 SCVHistory.com | Description of Santa Clara River Valley, Including Lyons Station, January 1873. Description of Santa Clara River Valley, Including Lyons Station. Original Headline: "Ventura to Los Angeles." In this flowery expose on four inches of rain that seem to have relieved three years of drought, the writer intersperses a few historical tidbits. To wit: The oil-rich region around Lyons Station has taken the short-lived name, Petropolis; and the stage station was obscured from view by the live oaks and wild walnut trees that encompassed it. Of particular note is the reference to the "poor settlers" in the Santa Clara River Valley who've been "driven hither and thither by the land-graspers." The writer guesses wrong about De Celis: The Rancho San Francisco wasn't one of the few original Spanish land grants. It was crown property, managed by the friars at the Mission San Fernando. It became a land grant after secularization under the Mexican regime. Gov. Pio Pico granted it to De Celis in 1846. It's curious that Rancho Camulos is not mentioned; it didn't become famous for another decade, but it was the most significant habitation along the route at the time. Misspellings of common words have been corrected; nonstandard spellings of names are noted. EDITORS PRESS: — The rain which began falling on the night of the 22nd of December, continued with intervals of cloudy weather and mild, up to the 29th; in the amount and manner of its coming it was as nearly perfect as it is possible. There was about four inches, a little more in some localities hereabout, and possibly a little less in some, but for the amount no rain we have ever taken note of has moistened the dry earth to such an extent. That four inches of water penetrated and saturated the ground from one to two feet, according to condition. In the hard trodden road and upon the more compact fields and pastures of the grateful draught was only imbibed, as one might say, to moisten the mouth of thirsty earth; but wherever the cultivation had been thorough and recent, the nectar tickled more than the palate and was drank deep. The croakers had been garrulous for some weeks and when the rain came it found them and the drones unprepared. But with the majority of Southern Californians this pluvial blessing was received with a gratitude unutterable. The three years of drought that have just passed cannot be realized by the people of the northern half of our coast, and even as far south as Santa Barbara there was only a partial failure from lack of rain. The suffering has been felt by the southern counties more keenly as they were being occupied and farmed by new comers, many of them from Eastern States, wholly or partially unused to the long dry summers of this Pacific slope, therefore nothing could have been more acceptable than the general and most beautifully penetrating rain. The hills and valleys are already covered with the mantle of verdure, and although the storm was of such long duration, it came and went to gently that hardly a lamb even perished by exposure; and although the feed in some places was almost totally gone, the stock generally passed through the time between the first rain and the starting of grass much better than is usually the case. For the past three years we have not ceased any of our ordinary out door occupations on account of storm, nor did we lose an hour at a mill by this. We started southward upon our conclud-journey [?] through Ventura county before the rain had fairly ceased, and were fully rewarded for any slight wetting by the magnificent variety of cloud and sunshine that illuminated or darkened the valleys and mountains of the Santa Clara. We are naturally buoyant, but more jubilant than usual, for the new dress nature was fast assuming under the effect of the warmth and moisture. Everything would be color de rose if we could exclude from our senses the outward evidences of "man's inhumanity to man." But in our ride up this beautiful valley, with its generous supply of running water, we come on every hand upon the poor settlers who have been driven hither and thither by the land-graspers who have managed to extend the interminable grant over every available acre. 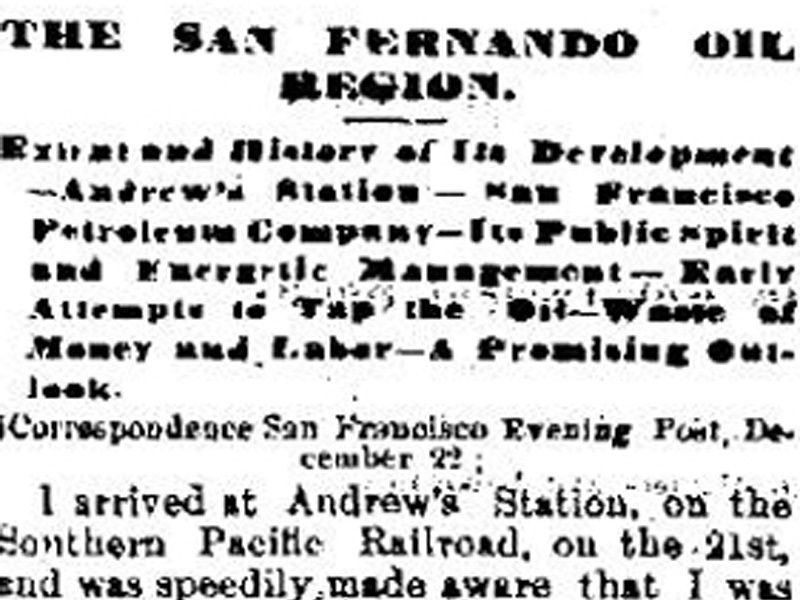 This Santa Clara is probably the most feasible railway route to and from the southern part of the State and Coast counties; and although at present sparsely settled and almost wholly undeveloped, is without a doubt one of the most productive in capacity of any like area in the State. Our route followed the windings of the Santa Clara for thirty miles, and in a south and easterly direction until we arrive at the junction of the San Francisquita [sic], where we turn westward toward Los Angeles upon the Visalia and Owens River road, which is intersected at this point. The petroleum is here again met with; for we are still in the peculiar sandstone and shale formation which accompanies the asphaltum and petroleum regions to the northward. What was originally called Lyons' Station is now Petropolis (pretentious?) and reminds one of the Mountain Caravan series along the old road to Nevada. This station is in a picturesque locality surrounded by live oaks and wild walnut, completely embowered and hidden, so that the traveler drops upon it as an agreeable surprise at the eastern base of the dividing chain of mountains that skirt Los Angeles and San Fernando valley on the east. Rising to the top of this ridge one looks Southward and Westward over a basin of 25 miles in diameter, enclosing the Old Mission of San Fernando and the rancho of the same name. We believe this is one of the estates of the original Spanish occupants that remains — a portion at least, in first hands. The DeCellis [sic] retaining 56,200 acres out of 115,200 which the whole rancho contains. This is the basin and reservoir of the Los Angeles river, and is so arranged as to retain and hold back the moisture which gives the never failing supplies, that irrigate the gardens and orange groves of the city of the Angels. That attitude has an important bearing upon the condensing or rain capacity of our locality, as is verified in this vicinity. The amount of rain fall lessens as we go south all the way from the mouth of the Columbia to the San Diego; but in the vicinity of the higher elevations of Los Angeles and San Diego there is an exception to the rule. Since the atmosphere has been cleared by the rain, vision is almost unobstructed; the mountains twenty miles away showing every feature in the clear cut outline; the light and shade of the corrugations on their sides tinted off in purple, brown and buff, to variegate this frame in which is set the lovely picture. And this morning, Mount San Bernardino and even San Jacinto, one hundred miles away, are as plainly seen glistening with their snow crowns, as though they were within ten miles. F.M.S. 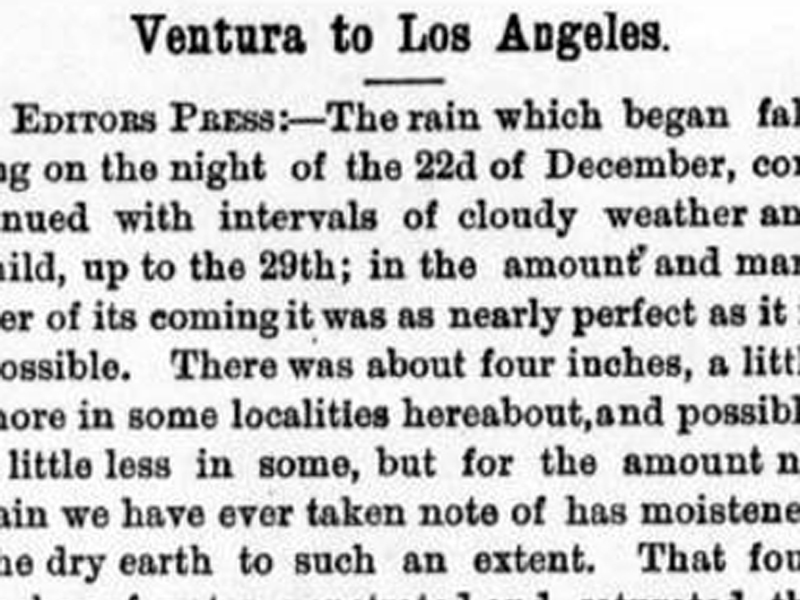 Los Angeles, Jan. 5th, 1873. Courtesy of Stan Walker and Dr. Alan Pollack.